Just 10 years ago, few homeowners recognized the link between a lush green lawn and the sick green ponds in their neighborhoods. That’s changing, particularly in Florida, where education programs directed at homeowners are beginning to pay big dividends for water quality in nearby ponds, rivers and Tampa Bay. “We still have a long way to go, but we’re starting to see changes that should benefit the bay over the long term,” said Nanette O’Hara, public outreach coordinator for the Tampa Bay Estuary Program. It’s difficult to tease out the precise impact that fertilizer has on water quality because there are so many variables—from age of the landscape to the use of reclaimed water—but residential neighborhoods contribute about 20 percent of the overall nitrogen entering the bay in stormwater. In one study, researchers from the University of South Florida’s College of Marine Science used radioisotopes to determine that “muck” accumulating in Old Tampa Bay near Safety Harbor was directly related to increased inorganic fertilizer sources. “There is no industry or agriculture in that area, so the excess nutrients are most likely from residential fertilizer use,” O’Hara notes. The most recent study completed late last year for the TBEP compares fertilizer use among homeowners in Hillsborough, Pinellas and Manatee counties where different fertilizer use ordinances are in effect. The work included random telephone surveys of homeowners throughout each county, along with in-person interviews of 81 homeowners living in selected communities with stormwater ponds that were routinely sampled for water quality. Homeowners in Pinellas County – with strict regulations banning both use and sale of nitrogen fertilizer in the summer rainy season – use significantly less fertilizer than their counterparts in Manatee or Hillsborough, according to the results of the telephone surveys. Pinellas County residents were significantly more likely (43%) to respond that they had heard about government regulations concerning residential fertilizer use than either Hillsborough or Manatee (both 26%). But, in a hopeful sign, a large majority of homeowners in all three counties who participated in the survey (90-93%) had heard that too much fertilizer can pollute nearby waterways. And, nearly three-quarters of those in each county were aware they should not fertilize right before a hard rain. Overall, Pinellas County homeowners surveyed by phone reported fertilizing their yards an average of 1.73 times in the last year, compared with 2.17 times a year in Manatee, and 2.46 in Hillsborough. However, homeowners in all of the neighborhoods that were part of the water quality sampling reported fertilizing more often, as much as 5.96 times a year in Hillsborough. This reinforces previous research that shows that the most intensely maintained residential landscapes are generally those in deed-restricted communities. The TBEP study looked at fertilizer use in terms of its impact on water quality in Tampa Bay, but management at Lakewood Ranch, the 17,500-acre community on the border of Manatee and Sarasota counties, had concerns that were closer to home. Maintenance costs for the community’s 300 stormwater ponds were rapidly rising, said Ryan Heise, director of operations in charge of maintaining the ponds and common areas. Ponds were filling with unsightly nuisance plants and residents who had paid a premium for waterfront property were not pleased, he adds. “We’d already installed additional plantings along the shorelines, purchased thousands of triploid carp – at about $10 apiece – and installed aeration devices in the ponds with the worst problems,” he said. The next step was contacting the University of Florida’s Institute of Food and Agricultural Sciences for help. A survey of more than 600 Lakewood Ranch residents showed little understanding of the link between landscape management and the health of the stormwater ponds, but a packed “Science Café” held by IFAS specialists and Lakewood Ranch management helped to bridge the knowledge gap.  65% of residents did not know about the Manatee County ban on summer applications of nitrogen fertilizer.  78% of them had fertilizer applied by professionals who should be aware of the rules (although half of the residents didn’t know that the county ordinance requires their lawn service to be certified).  48% of residents did not know that stormwater from their lawns and streets drained into stormwater ponds or that the ponds were connected to each other. Along with increased maintenance costs to keep the ponds attractive, high levels of nutrients may require that they’re dredged more often – at a cost of about $100,000 per acre of pond, said Chris Dewey, coordinator of the Florida-Friendly Landscaping Program in Pasco County. “The average pond will have to be dredged every 20 to 25 years assuming that it fills in from erosion and algae at an average rate of 0.5 inches per year.” But the “average” can be deceiving, he said, because the range is actually anywhere from 0.1 inches to a full inch per year, depending upon the amount of algae growing in the pond – which is directly related to the nutrients available. For homeowner associations concerned about costs: “A pond can need dredging every 10 years or every 100 years,” he adds. 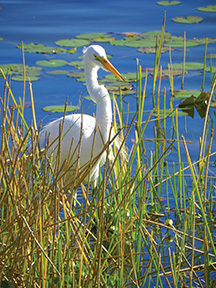 Photo by Richard Moran, Lakewood Ranch Community Development District supervisor.